Foreign Minister Shah Mehmood Qureshi during his address at the US Institute of Peace (USIP) in Washington on Wednesday said that Pakistan wants to build relationship with the United States based on trust and mutual respect. Shah Mehmood said that the last two years of US-Pakistan relations have been tough. We re here to reconnect and rebuild, and focus on peace, reconciliation, and stability. He said that Pakistan has a new government, and its goal is change and development. We need to put in a greater effort to improve our image and there s a lot we can do to fix it. He said Pakistan wants relations with United States based on mutual interest and respect. On the closing space for foreign NGOs in Pakistan, Foreign Minister Qureshi said that he has heard their concerns and will return to Pakistan to advocate for them. Talking about the overseas Pakistanis, Shah Mehmood said that we are so proud of the Pakistani diaspora abroad. We want to enable them to vote in Pakistan, and get them to contribute to change. He said that Pakistan has rendered unprecedented sacrifices in war against terrorism and the international community should acknowledge Pakistan efforts in this regard. He said that Pakistan cannot surrender to terrorism. We have to take them on. We have to build on what we have achieved. He invited Members of Congress to visit Pakistan, especially the areas known as the Tribal Belt, and see themselves how they really are. Cutting off equipment and assistance that could be used to combat terrorism, I don t know what that will help, Qureshi said. The "blame game" will not be productive. "Blaming and shaming is easy, but where will it get us? FM Qureshi said that Pakistan wants stability in South Asia and a developed and peaceful Afghanistan is very imperative for peace in Pakistan and in the region as well. He said I am going back to Pakistan with hope and with a positive view. 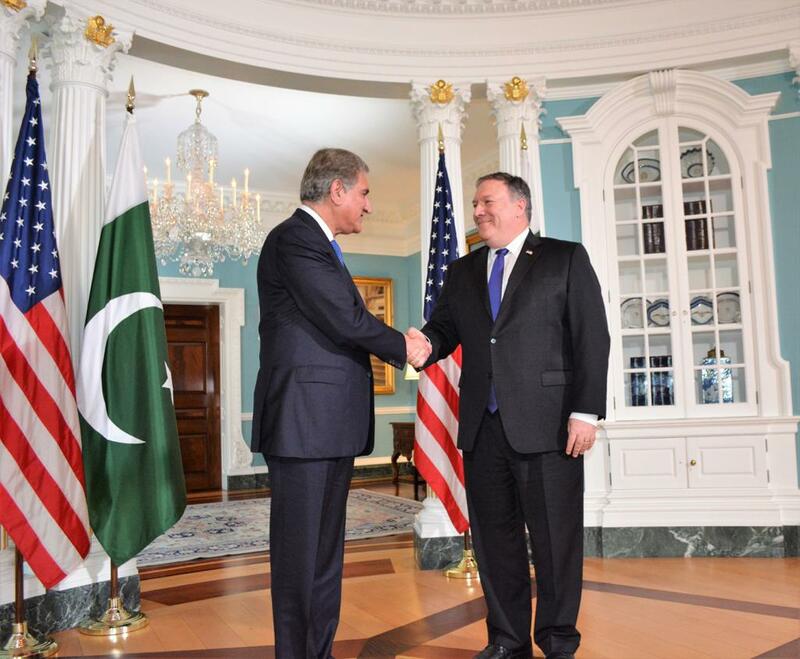 In my view, my meeting with Secretary Pompeo in Pakistan was good and constructive. My meeting yesterday with him and NSA Bolton was useful, engaging and forward-looking, he said.